Smaller than a credit card, the Enclustra Mercury+ AA1 SoC module offers universal connectivity to meet a choice of applications, says the company. The Mercury+ AA1 SoC module is based on the Arria 10 originally produced by Altera, but now an Intel product, since Intel bought Altera in 2015. The SoC has an integrated dual-core Arm processor, I/O, interfaces and memory to enable the module to fulfil extremely demanding data integrity requirements, says Enclustra. 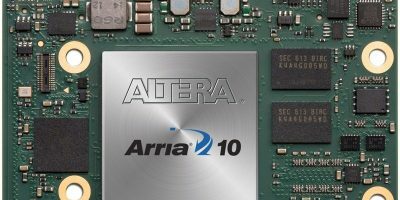 The Arria 10 SoC is based on 20nm technology and up to 286 user I/Os, including 12 multi-gigabit transceivers, each offering a data transfer rate of up to 12.5Gbit per second. Interfaces for USB 3.0, PCIe Gen3 x8 and Gigabit Ethernet are included. This, says Enclustra, enables the module to meet the connectivity requirements of almost every application. There is also up to four Gbyte large DDR4 SDRAM with ECC for data throughput with guaranteed integrity, adds Enclustra. The Mercury+ AA1 SoC module is available in both commercial and industrial temperature ranges and needs just a single five to 15V supply for operation. Planned availability is 10 years. Enclustra offers design-in support for its products. Used with the Mercury+ PE1-300 or Mercury+ PE1-400 baseboards, the Mercury+ AA1 is a powerful development and prototyping platform, claims the company. Further expansion options are provided by the LPC/HPC FMC connectors on the PE1 base board, which is compatible with a range of plug-in cards from manufacturers. Selection includes ADCs, DACs, motor control cards and RF links. Enclustra also offers a comprehensive ecosystem for the AA1, offering all of the hardware, software and support materials required. Detailed documentation and reference designs make it easy to get started, in addition to the user manual, schema, a 3D-model (STEP), PCB footprint Footprint (Altium, OrCAD, PADS, EAGLE) and differential I/O length tables. The Enclustra Build Environment can be used to compile the Enclustra SoC modules with an integrated Arm processor. The module and base board are selected by a graphical interface. Next, the Enclustra Build Environment downloads the appropriate Bitstream, Bootloader and the required source code. Finally, U-Boot, Linux and the root file system, which is based on BusyBox, are compiled. Different types of modules can be used on the same base board, such as the Intel Cylcone V SoC-based Mercury SA1 or Mercury+ SA2, using compatible connectors.